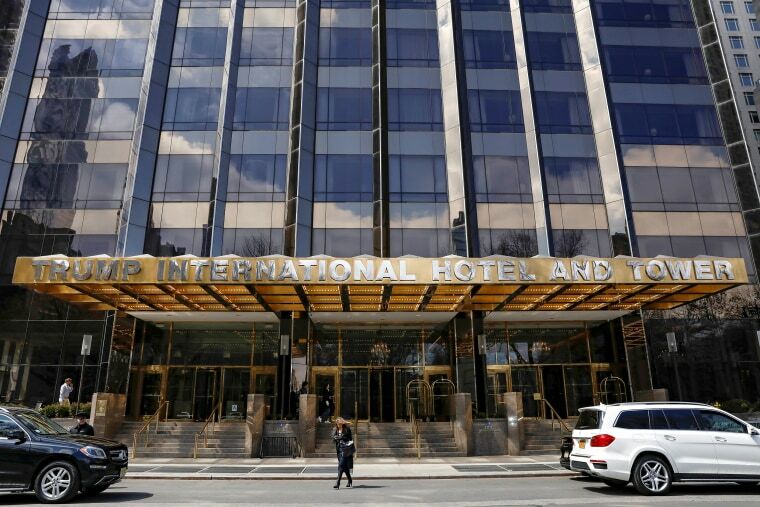 Some wealthy patrons are steering clear of Trump properties, saying the country club experience is now ruined "by metal detectors and bomb-sniffing dogs." Trump dropped 138 spots to 259 on the Forbes 400, an annual measure of the richest people in the U.S. During that same period, Amazon founder and CEO Jeff Bezos rose to the top spot, with an estimated fortune 52 times greater than that of the president, at $160 billion. Forbes attributed the decline of Trump's fortune to three main factors: e-commerce eating into the value of Trump's real estate holdings, the intrusion of heightened security at Trump's resorts, and Trump's own over-reporting of the size of his penthouse. "Much as he's trying — and he's definitely trying — Donald Trump is not getting richer off the presidency," according to Forbes. Revenue at his golf clubs is down by 9 percent, in part because of the increased security that guests have to go through to attend the resorts. Trump Tower condos are down 33 percent from their highs, and have fallen every year since Trump announced his run for the presidency. Overall hotel revenue is down by $30 million since Trump announced he was running for president — and three major Trump-branded hotels have even stripped his name from their properties. There are some bright spots for the Trump empire: Business at the Trump International Hotel in Washington is doing well thanks to an influx of foreign government officials and GOP bookings. Similarly, the value of the "winter White House," Mar-a-Lago, rose by $10 million, to $160 million — and also reportedly doubled its initiation fee to $200,000. Trump notwithstanding, it's been a record year for the nation's billionaires, according to Forbes. Their total net worth rose 7 percent year on year to a high of $2.9 trillion, with an average net worth of $7.2 billion each, versus $6.7 billion last year. The oldest person on the list is media mogul Sumner Redstone, 95, with $4.8 billion. The youngest is Snapchat CEO Evan Spiegel, 28, worth $2.2 billion. Trump first appeared on the Forbes list in 1982 with his father, Fred Trump, with $200 million each. The following year, Trump Sr. disappeared from the list, and Donald Trump's fortune was listed at $400 million, according to Dan Alexander, one of the reporters of the Forbes piece.